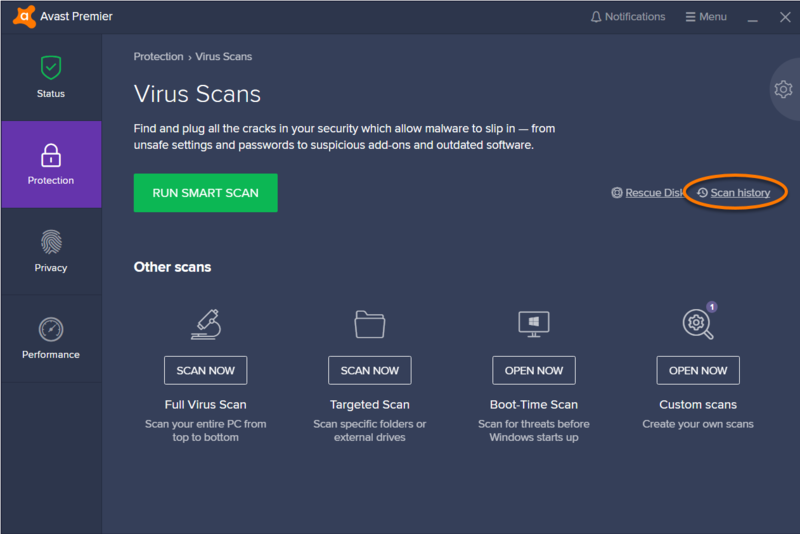 Smart Scan: a comprehensive scan that detects malware, out-of-date software, browser add-ons with poor reputations, network threats, and performance issues. Full Virus Scan: a predefined, in-depth scan of your system that checks your storage drives and memory for malware (including rootkits). Targeted Scan: scans the folders you select when you initiate the scan. Boot-Time Scan: scans your PC during the next system startup before any malware is launched. Running a Boot-Time Scan during startup improves the chances of detecting and removing malware before it can attack your PC. Custom scans: scans your PC according to the parameters that you specified for your scan. Explorer Scan: scans specific files or folders directly from your desktop via File Explorer. Open the Avast user interface and go to Protection ▸ Virus Scans. Smart Scan: Click the Run Smart Scan button. Full Virus Scan: Click the Full Virus Scan tile. Targeted Scan: Click the Targeted Scan tile, then select the file or folder you want to scan, and click OK.
Boot-Time Scan: Click the Boot-Time Scan tile, then click Run On Next PC Reboot. Custom scans: Click the Custom scans tile, then click Scan Now on the panel for the scan you want to run. 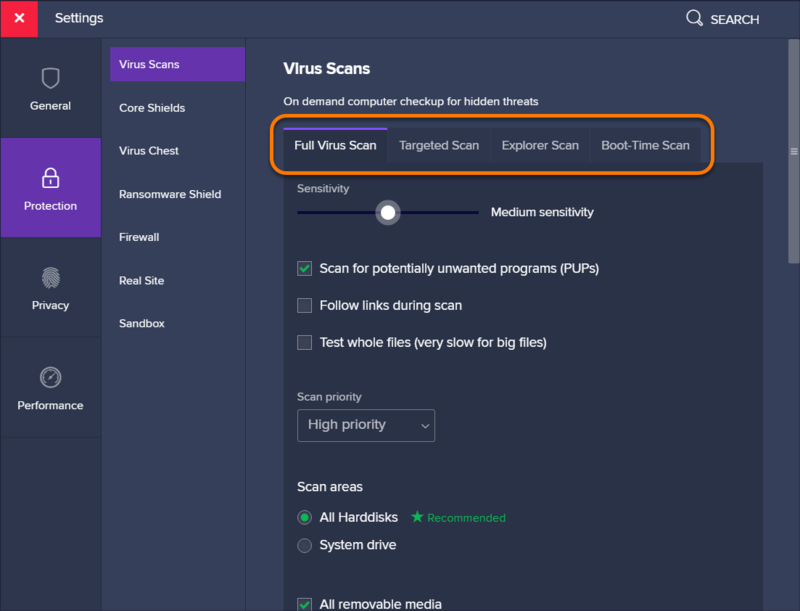 To run Explorer Scan, right-click a file or folder on your desktop or in File Explorer, then select Scan selected items for viruses in the menu that appears. Click the Custom scans tile. Click Create A New Scan. Scan name: type a name for your scan into the text box. 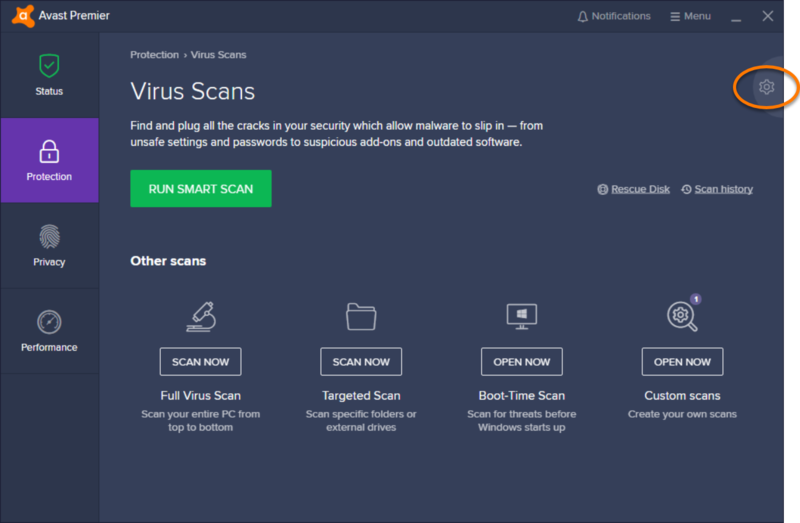 Scan type: select either Full Virus Scan or Targeted Scan depending on what you want your scan to check on your PC. Frequency: define how often your scan runs. Sensitivity (Medium by default): the higher the sensitivity, the higher the protection and potential for false positive malware detection. Lower sentivity reduces the potential for false positive detections, but may reduce the effectiveness of the scan. 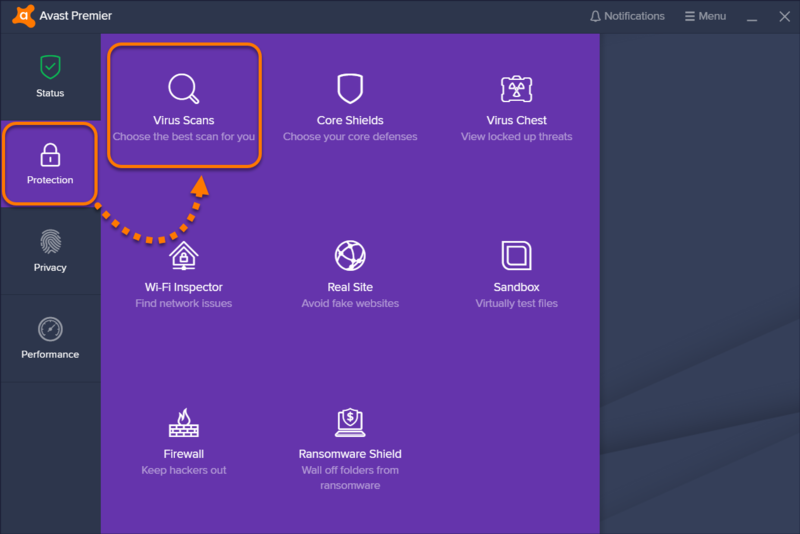 Test whole files: enables Avast to scan entire files rather than only the parts typically affected by malicious code. Scan priority: use the drop-down menu to set your Scan priority (Medium priority by default). All Removable media: enables Avast to scan applications that launch automatically when you insert a USB or other removable device into your PC. Scanning removable media may take a long time due to speed limitations. 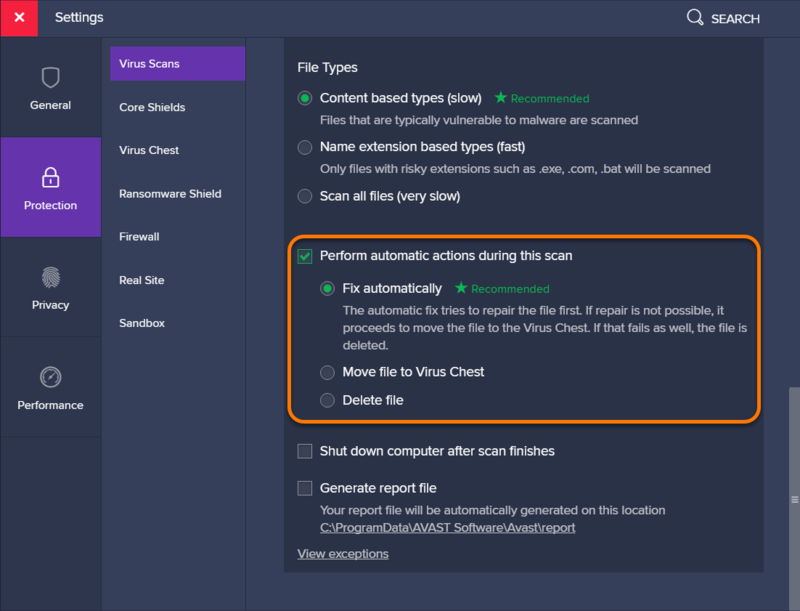 Perform automatic actions during this scan: tick this option to enable it, then define the automatic action Avast will perform when an infected file is found. Shut down computer after scan finishes: enables Avast to shut down your PC after your scan completes. Generate report file: enables Avast to create and store a report file automatically after the scan completes. Exceptions: click View exceptions, click Add Exception, then locate a file, folder, or web page that will not be scanned by your new custom scan. Parameters for new Custom scans will save automatically and can be reconfigured at any time. 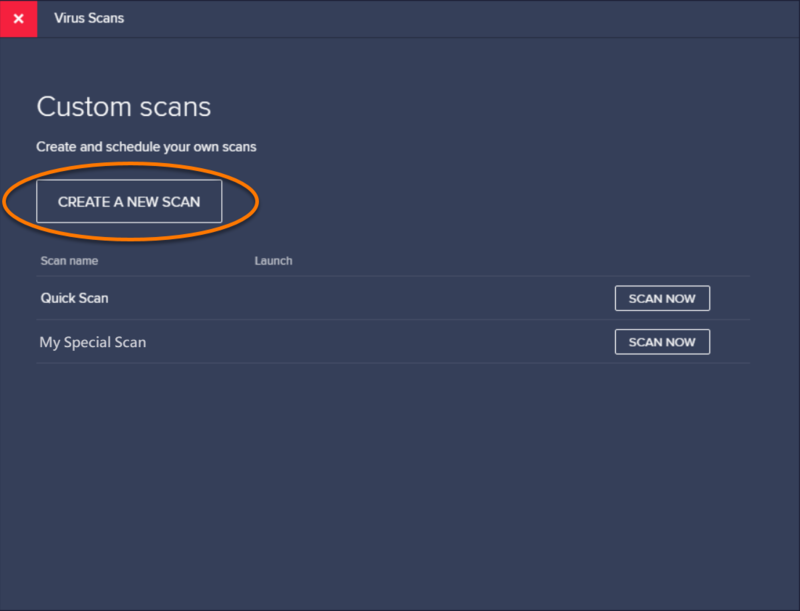 To run a new Custom scan, go to Protection ▸ Virus Scans ▸ Custom scans, then click Scan Now next to the scan you want to run. 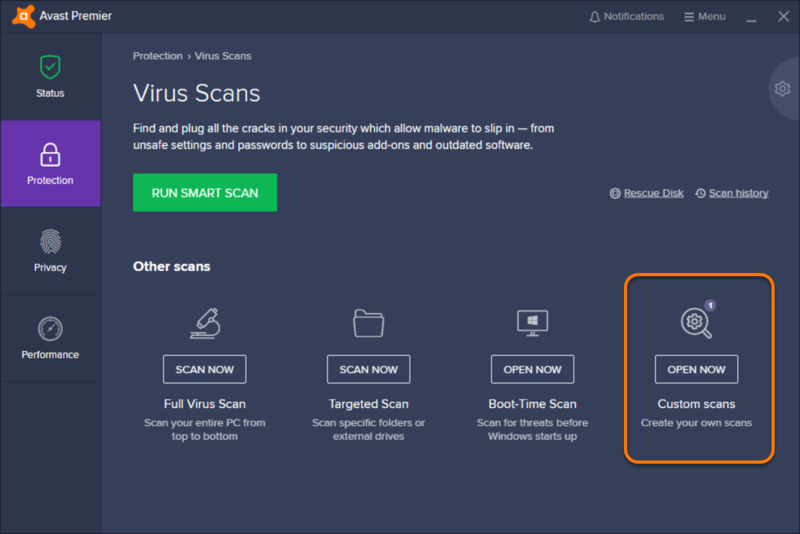 After a scan completes, Avast displays all found issues. You can resolve the issues directly on the results screen, or configure each Virus Scan to resolve issues automatically upon detection. Some detections may require a separate paid license to resolve. You can define how each scan automatically reacts to a found issue. Click Protection in the left panel, and ensure Virus Scans is selected. Click the scan you want to define automatic behavior for. Fix automatically: Avast attempts to repair the file. If unsuccessful, the file is moved to the Virus Chest. If that fails, Avast deletes the file. Move file to Virus Chest: Avast sends the file directly to the Virus Chest where the file cannot harm your system. Delete file: Avast permanently removes the file from your PC. 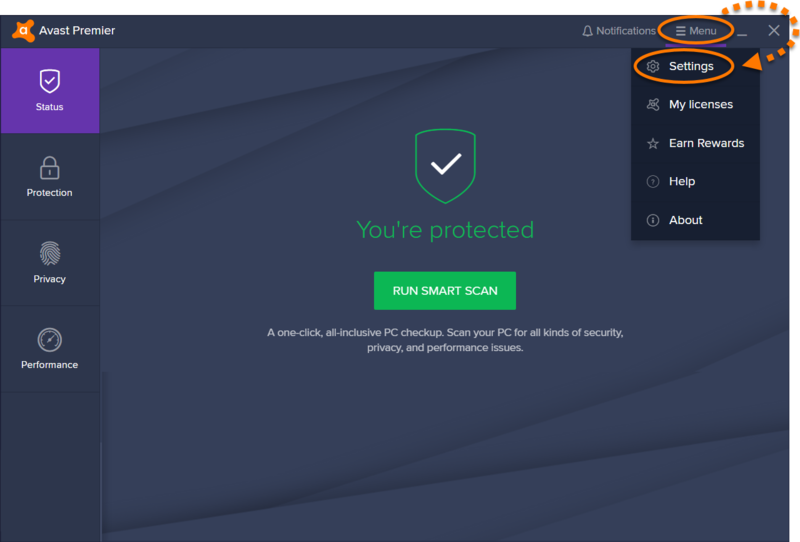 If you want Avast to do nothing when an infected file is found, untick the box next to Perform automatic actions during this scan (not recommended). 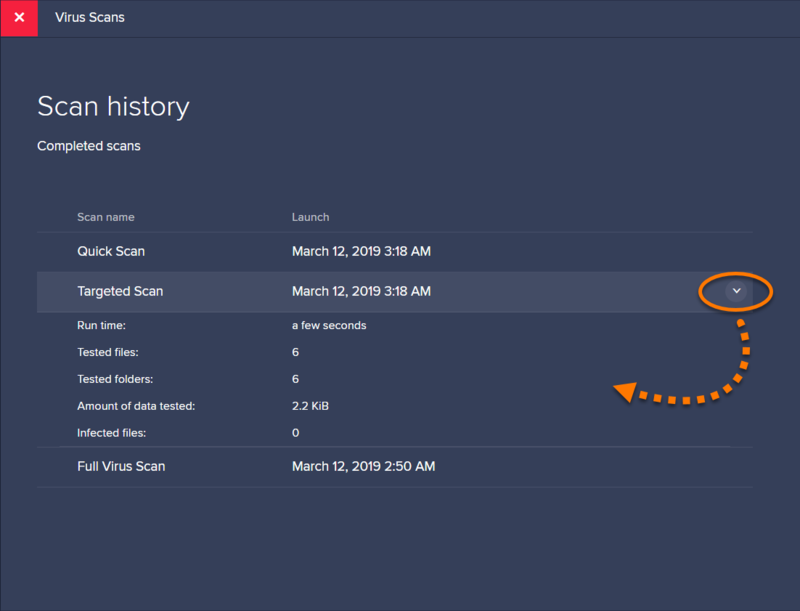 To manage unresolved scan detections at any time, go to Protection ▸ Virus Scans ▸ Scan history. Archive is password protected: indicates that the file is password protected. Some programs use password protected archives to store their data even if you did not set the password. Depending on your scan settings, only the "wrapper" file is scanned while the archive content is not. Archive is corrupted: indicates that the file may be corrupt because it was only partially downloaded or saved to your harddisk, or that it is a special type of archive. The process cannot access the file because of another process: indicates that another process or program was accessing the file during the scan. The file is a decompression bomb: indicates that the file was too large to be decompressed for malware analysis. Decompression of large files generates vast amounts of data which can cause your system to be unstable or cause it to crash. Files that are stored in archives cannot harm your system unless they are decompressed. Click Settings (the gear icon) in the top-right corner of the Virus Scans screen. Select the scan you want to adjust settings for. If you suspect your PC is infected with malware and all other Virus Scans (including the Boot-Time scan) were unable to resolve the issue, you can use Rescue Disk. Rescue Disk enables you to scan your PC when your system is not running. This method significantly increases your chances of detecting and removing malware because the malware is detected before it is able to counteract. Hover your cursor over a scan panel, then click the down arrow to see the scan details. Click the red X in the top-left corner to return to the main Virus Scans screen.